Want to be notified of new releases in Ionaru/easy-markdown-editor? #76 Compare This branch is 221 commits ahead of sparksuite:master. onToggleFullScreen: A function that gets called when the editor's full screen mode is toggled. The function will be passed a boolean as parameter, true when the editor is currently going into full screen mode, or false. image: The text to use when prompting for an image's URL. Defaults to URL of the image:. link: The text to use when prompting for a link's URL. Defaults to URL for the link:. hljs: An injectible instance of highlight.js. If you don't want to rely on the global namespace (window.hljs), you can provide an instance here. Defaults to undefined. markedOptions: Set the internal Markdown renderer's options. Other renderingConfig options will take precedence. Below are the built-in toolbar icons (only some of which are enabled by default), which can be reorganized however you like. "Name" is the name of the icon, referenced in the JS. "Action" is either a function or a URL to open. "Class" is the class given to the icon. 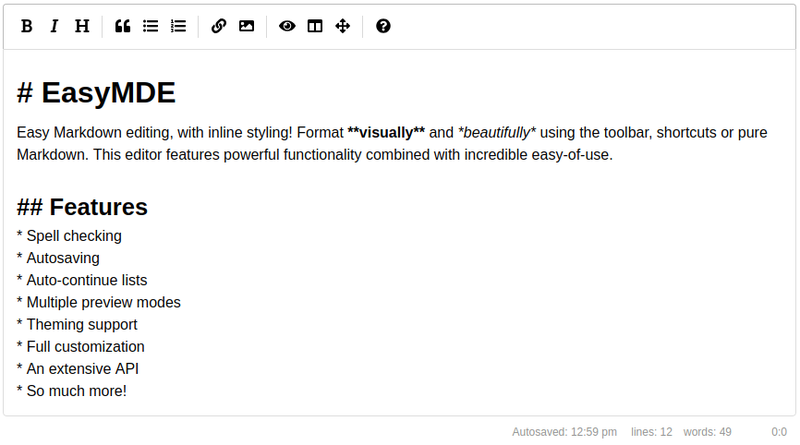 "Tooltip" is the small tooltip that appears via the title="" attribute. Note that shortcut hints are added automatically and reflect the specified action if it has a key bind assigned to it (i.e. with the value of action set to bold and that of tooltip set to Bold, the final text the user will see would be "Bold (Ctrl-B)"). Copyright (c) 2015 Sparksuite, Inc. Copyright (c) 2017 Jeroen Akkerman.